The Squiggle is a vertical alternative to the traditional keyboard for visualizing combinations of notes, by David Zethmayr. The Squiggle is the organizing principle of Zethmayr’s Slantnote notation. The Squiggle is all about pattern, diatonic and otherwise. It’s a communication medium between ear and eye that is easy to cultivate. Ear-first musicians such as singers and multi-instrumentalists will find it convenient for converting improv and intuition skills to music reading, transposing and arranging skills. Notice how the squiggle preserves the cyclic diatonic visual …-3-4-… pattern through all the naming conventions schematized on it above. This is the cis-trans principle at work. Since there are but two banks to Squiggle River, notes residing on either side participate in intervals and patterns of intervals according to whether their semitone distances are even or odd. Squiggle terminology expresses even-odd in terms of same side or opposite sides, shortened to cis and trans respectively. 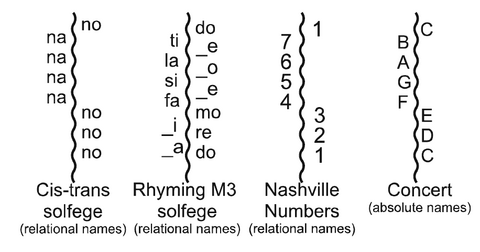 The terminology of squiggle theory hinges on the cis-trans distinction, crucial to characterizing intervals, triads and chords. Notes on opposite sides (banks) of the squiggle are trans to each other. Notes on the same side are cis (pronounce as in “cistern”). It may not be obvious to a beginner that left-right mirroring is not important in squiggle. Only cis-trans matters. The diatonic …-3-4-… pattern (or any other cis-trans pattern) is independent of the left-right distinction. 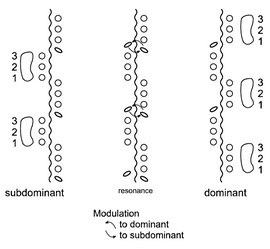 Saying so explicitly is preliminary to a discussion of modulation. Being key-agnostic does not mean the concept of keys is too advanced for squiggle theory. To the contrary, squiggle clarifies how keys happen. Modulation is a pattern concept requiring either a ready familiarity with the diatonic implications of C-D-EF-G-A-BC as notes are flatted or sharped, or a visual such as the squiggle or some Category Eight-compliant notation staff. Independent of any staff reference, the squiggle offers its clear cis-trans binary distinction, the distinction that is implicated in most of the theoretic difficulties in front of the beginning musician. When a slanted note shifts sides, it might be the degree 4 note (slanted right-end-down) sharping (raised a semitone) to become the 7th degree of a new key, the dominant of the old key. The diatonic “34” pattern resumes but with the cis groupings on reversed squiggle banks. Similarly, flatting the 7th degree (lowering it a semitone) makes it become degree 4 of a new key, the subdominant of the old key, preserving the diatonic “34” pattern as in the opposite modulation.